Verify your study patients before they get messages or surveys. Clients often ask us “are text messages encrypted?” Text messages are not encrypted, but that shouldn’t prevent you from taking measures to help your study participants maintain their privacy, while enabling them to use the most popular channel on their mobile phones. 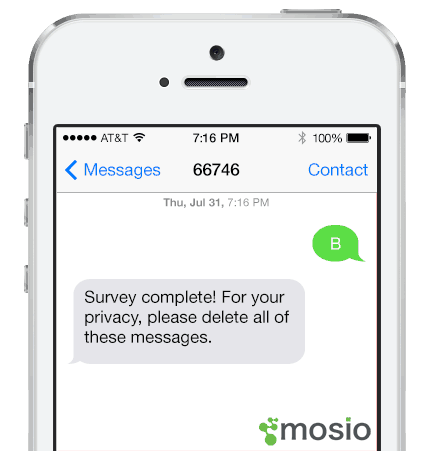 Mosio’s mPIN™ enables researchers to verify it is actually the study participant who is receiving a message (or survey) before it is sent. What is Mosio’s mPIN™ technology? Mosio’s mPIN™ technology arose from two key issues: clients wanted to be able to improve patient privacy and ensure their participants were the ones receiving and responding to messages (or surveys), but text messaging on mobile phones does not have end-to-end encryption. While encryption can be achieved with a downloadable mobile app, not everyone has a smartphone, knows how to use all of its functions, or is willing to download and utilize an app dedicated to a clinical research study. In fact, over half of smartphone users download less than one app per month. On the other hand, most people know how to use the texting feature on their device. It is the most popular channel on mobile phones in general, making it the perfect medium for communicating with study participants. A client using Mosio for text message surveys to collect data in a clinical trial needed to confirm that the patient responding was indeed the said patient. Further, the client also wanted to be able to send survey questions or get responses that contained sensitive information. Our Development Team created mPIN™, a simple-to-use and effective method of verifying the intended person. 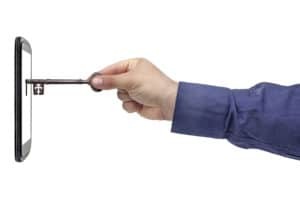 At the beginning of the study, staff enroll participants into the system and ask them for an easy-to-remember PIN, which becomes the participant’s mPIN™. Staff then explain that at certain study milestones, study participants are required to respond with a PIN via text message before the next message (or series of survey questions) begins. When used in data collection, the first question of the survey asks the participant for their mPIN™. After they respond correctly, they will begin receiving questions via text. It can also be used before sending any other message where you want to ensure the participant is the one receiving the message. After the participants complete the survey, the thank you message encourages them to delete all of the messages (incoming and outgoing) in their message history. Mosio’s platform is hosted on HIPAA-compliant servers and we follow HIPAA technical and administrative guidelines. 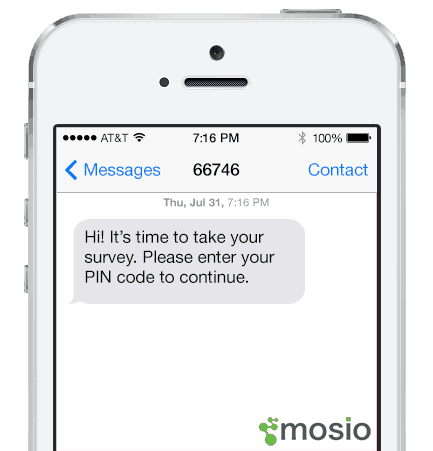 As an extra step in security to ensure that study participants are the ones seeing the messages on their phones, we are able to configure the platform using Mosio’s mPIN™, a specialized access PIN for individual study participants. HOW ELSE DO WE ENSURE PRIVACY? mPIN™s can be combinations of numbers and/or letters, increasing the security level of the PIN. Upon three PIN failures, the system will pause the messaging for the participant and send an email notification to study staff for further handling. Upon getting the notification, study staff can call the participant, verify their identity, reset the system, and let them know their mPIN™ over the phone so they can begin receiving messages again. 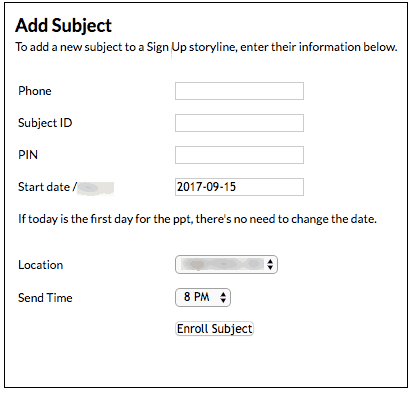 Clients are encouraged to customize their “survey completion” messages with wording that tells participants to delete all messages in their mobile phone history. Mosio clients are provided with a list of guidelines to educate staff and participants on best practices to keep their information safe, such as always having a password lock on their mobile phones. We share our White Paper: Text Messaging and HIPAA Compliance in Research. mPIN™ is one of the dozens of innovative ways Mosio differentiates itself from traditional mobile messaging software companies and establishes itself as an asset for the clinical research industry. Our Development Team listens to the needs of our research clients to create best-in-class research solutions on the most utilized app available on every mobile phone: text messaging.